I love trying to introduce healthy and tasty herbs to just about everyone I know. So it's no secret that I love to gift herbal infusions. These are great for just about everyone. Cooks love the flavors, health nuts love the benefits, and people who may never use them still think they're pretty and will display them somewhere. Speaking of using them, how do you? There are so many ways. The first, and easiest way to use these is to sprinkle them on top of your salads or add a little bit of oil to them and make them into super tasty salad dressings. I'm also very southern and eat my cooked greens with vinegar on them. Some of these add a nice kick to my greens. You can mix them with honey and water and make a nice lemonade-like drink. This is an especially good idea for the fruit flavored vinegars. I also love to eat cucumbers (and other fresh veggies) that have been drenched with vinegar, but not necessarily pickled. Now I make these year round for personal use, but I figured that this Christmas I would gift a few to certain people I know. 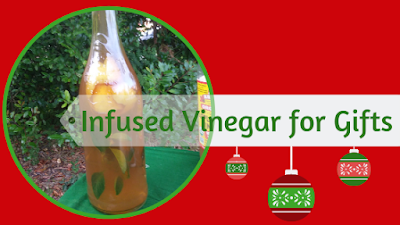 So here's my instructions for infusing vinegar (or cooking oil) as gifts for the Holidays! What I used in this particular infusion was Apple Cider Vinegar. 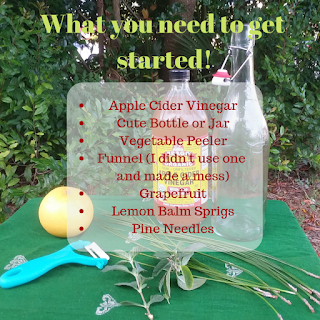 It's got a great flavor that goes really well with citrus and since I decided to use Lemon Balm, Pine, and Grapefruit for my vinegar, that's what I decided to use. Other vinegars that work really well are Rice Vinegar, Red Wine Vinegar, and Malt Vinegar. But really you can use whatever vinegar you want. You can use whatever combination of herbs you want in these infusions, and you can used dried as well as fresh. This particular vinegar uses Grapefruit peel, Lemon Balm sprigs (because of the pretty flowers! ), and fresh Pine Needles. Other examples may be a Cranberry Orange Vinegar, Ginger Lemongrass Vinegar, or even an Italian Herb Vinegar with Basil, Oregano, and Garlic. You can even turn any of your favorite cooking herb blends into an infused vinegar. Have fun! For some flavor inspirations, this page has links to over 20 different recipes. Or keep reading because I'll give you a few of my favorite infused vinegar recipes from the past! You can use this same process to infuse other things as well, such as oils, honey, or even some vodka if you're feeling extra spirited. For oils, I like to use a variety of healthy oils such as Extra Virgin Olive Oil, Avocado Oil, or Cold Pressed Grapeseed Oil. Sanitize your bottle and allow to air dry. Wash all of your fresh ingredients. Peel your grapefruit and slide it into your bottle. Follow up with your lemon balm sprigs. 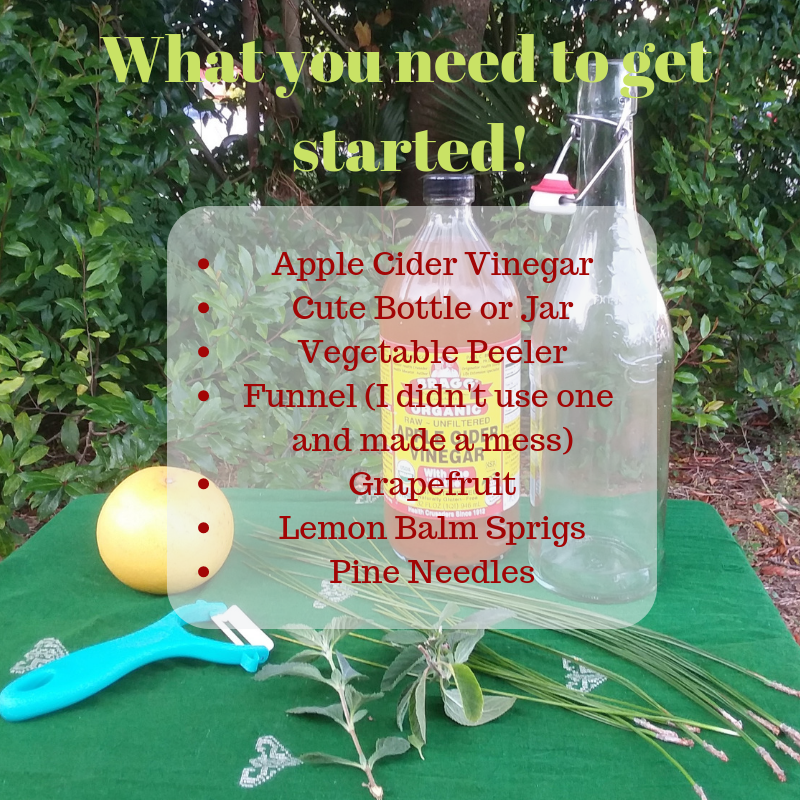 Clean up the ends of your pine needles and stuff those in your bottle as well. I ended up only using about 4-5 clusters of needles. *Optional, heat your vinegar until just under boiling. Pour your vinegar into the bottle, making sure to cover up all those yummy herbs. Seal and allow to sit 2-4 weeks before gifting/using. Place the herbs in a clean jar/bottle. Cover herbs with vinegar/liquid of choice (warmed to help speed up the infusion process). Seal the jar/bottle and allow to sit for 2-4 weeks before using/gifting. I hope you enjoy these recipes. Have fun creating your infused gifts! If you have any questions or comments, please leave them below! Also, if you want me to cover anything specific, I'd like to know!